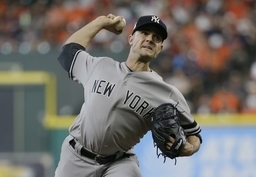 PHILADELPHIA (AP) David Robertson got himself a new deal in a new pair of pinstripes. The 33-year-old right-handed reliever and the Philadelphia Phillies agreed to a $23 million, two-year contact on Thursday. Robertson gets $10 million this year and $11 million in 2020, and the Phillies have a $12 million option for 2021 with a $2 million buyout. Hector Neris led the Phillies with 26 saves in 2017 and had 11 last year. He's also in the mix to pitch the ninth. It'll likely be determined by matchups. Robertson has even better numbers against lefties than righties during his career. He has held lefties to a .188 batting average and .268 on-base percentage vs. .222 and .302 for righties. Robertson represented himself in contract negotiations for the first time. Klentak said he was impressed and called it a "unique" experience talking money directly with the player. "He was very well prepared, he knew the market very well, he knew what was important to him and he was able to articulate it well and that helped us get to a deal," Klentak said. He's 53-32 with a 2.88 ERA and 137 saves in 654 career appearances, all in relief. "I had a great time playing in New York. They are an excellent organization," Robertson said, adding he spoke to Yankees general manager Brian Cashman about returning. "New York will always hold a special place in my heart. It was just time for me to go someplace else." The Phillies have been active this offseason, acquiring shortstop Jean Segura and signing outfielder Andrew McCutchen. They finished 80-82 last year after leading the NL East in August. Klentak said the team had a "productive" meeting with Manny Machado last month. "I expect that the dialogue there will continue," Klentak said.